WASHINGTON, Jan. 16, 2019 /Christian Newswire/ -- A new Marist Poll survey finds that Americans overwhelmingly oppose using faith as a factor in appointments to jobs in the federal government. 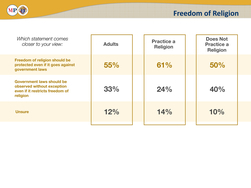 In addition, strong majorities of Americans support protection of religious freedom and think that people of faith should be able to serve as judges and other government appointees. 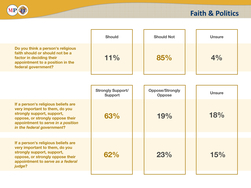 By a margin of more than eight to one (85 percent to 11 percent), Americans say that faith should not be a factor in deciding a person's appointment to a position in the federal government. This includes about three quarters of Republicans (74 percent), and about nine in 10 Democrats (90 percent) and independents (89 percent). The survey of 1,066 adults was conducted January 8 through January 10, 2019 by The Marist Poll, sponsored and funded in partnership with The Knights of Columbus. The results coincide with the observance today (Jan. 16) of the Federal Government's annual declaration of Religious Liberty Day. "Americans rightly support religious freedom and reject religious tests for public office," said Knights of Columbus CEO Carl Anderson. "Article VI of the Constitution, which forbids religion tests, continues to strongly resonate with the overwhelming majority of Americans, who believe that faith should not be a barrier to someone's appointment to public service." 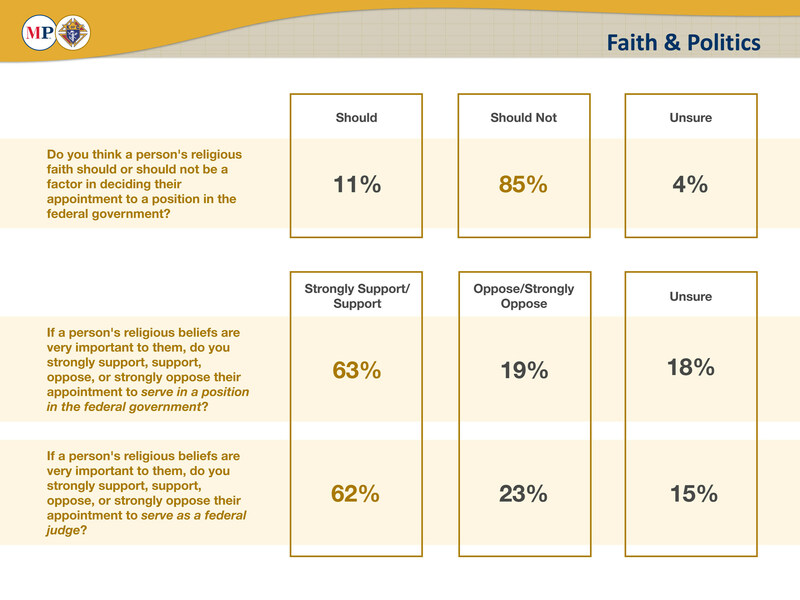 Support people for whom religion is important serving as appointees in the federal government (63 percent to 19 percent). This includes about six in 10 Democrats (58 percent) and independents (61 percent) and more than 7 in 10 Republicans (72 percent). 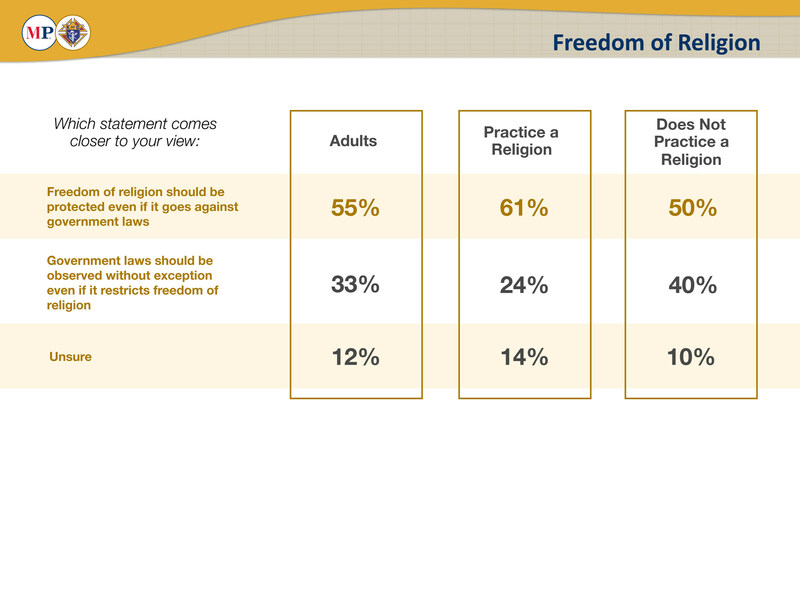 Support people for whom religion is important serving as federal judges (62 percent to 23 percent). This includes about six in 10 Democrats (59 percent) and independents (60 percent) and more than 7 in 10 Republicans (73 percent).